There are many different kinds psychic reading available to those seeking guidance from a higher power. Most people are familiar with some of the more popular forms of psychic readings whether they are extremely interested in psychic readings or not. Some of the more popular forms of psychic readings are palm reading and tarot card readings. Almost everyone has heard of these. Some people that do not necessarily believe in psychic abilities may have even had one of these readings done on them just for entertainment. There are a multitude of other different types of readings available to those that are looking for some divine guidance that are less well-known than their tarot card or palm reading counterparts. One of these is a psychic rune reading. You may not be familiar with this type of reading unless you have dug deep into astrology and have a deep passion for it. The truth is that rune readings have been around forever and are one of the oldest types of psychic readings in the world. A rune is basically a type of alphabet. These runes were first used by tribes in what is today Germany and Scandinavia by tribes in those areas. As the runes moved throughout the region and were employed by different tribes some were taken out of the original rune alphabet. The original rune alphabet was said to have about 24 individual characters. In some regions of Scandinavia 6-8 of those characters were taken out of the alphabet. There were other areas that employed the rune alphabet in which up to 33 characters were used in the alphabet and sometimes different characters were combined to make new symbols as well. 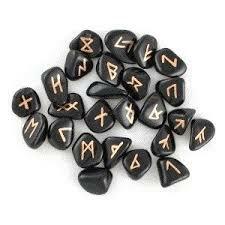 Runes were first gained popularity in about 100 B.C. Like anything spread through oral tradition these runes, as stated earlier, changed and grew as they moved from region to region. Each symbol in the rune represented some kind of Norse God or Germanic diety. Rune casters during this time had to be highly skilled and developed to be able to decipher and cast runes because of the wide variation of alphabets employed in even areas that were close together. Unlike a lot of people's perception of psychic readings, runes were not used just to predict someone's future. The symbols were also believed to have magic properties that could help heal or guide those that were receiving the rune reading. While rune readings are not nearly as popular today as they were 500 or 600 years ago, there are still a small group of people that understand all the symbols and symbol combinations available to those that want to receive a rune reading. Rune readings work in a similar way as other readings as items are randomly selected in order to help the psychic determine what is going on with the subject of the reading. Those that perform rune readings must possess vast knowledge in order to perform a rune reading correctly. Because the ancient tradition is so steeped in Norse mythology, an extensive knowledge of that subject matter is required in order to provide a proper reading. Typical sets of runes have 24 runes like the original rune alphabets. Most of the psychics that perform rune readings are traditionalists that like to harken back to the origins of the art form when performing their readings. In ancient Norse culture wood was considered to be a divine substance. This is why most rune sets today are made from wood. Each rune symbol or rune combination symbol is emblazoned on wood. The person performing the reading then places the chosen symbols in a bag and mixes them. When they feel compelled to release them they throw the items on the floor and being the reading from there to determine what is going on with the person that is receiving the reading. There are many different layouts when it comes to rune casting. Some of them are more organized than others. Typically rune casters will seek to have a more organized and detailed rune layout depending on how complicated and important the question that they are trying to answer for their subject. Because there are so many different types of layouts available to rune casters, there is no specific way to perform a reading. There are some layouts that are more popular than others though. The most popular form of rune reading uses five symbols, usually 1 main symbol with four other symbols surrounding it. The central rune is the focus and represents the subject of the questions the other four symbols augment that. The caster may use different layouts depending on how serious the question is. They may even use multiple layouts to answer the same question if they feel that is necessary. A good rune caster will do whatever it takes to get the most accurate reading possible. As stated before, rune casting is an ancient tradition that not many can effectively perform today. As time goes on there are less and less people that understand the symbols. This means that there are fewer and fewer people that can perform the readings. The runic alphabet is still employed by some people. It is a popular activity for those of Nordic descent that are trying to get a better idea of where they come from and the traditions that their ancestors had thousands of years ago in their motherland. Some people also get runic readings just for fun. Those that have not found the success that they desired when getting palm or tarot card readings may also seek out a runic reading as well. The first step to getting an effective and good runic psychic reading is to get the right guide to complete your reading. The better your psychic understands the runic alphabet, the more accurate their reading will be. It is also important to ask the right questions when getting a runic reading. You cannot get a good reading if you are not asking honest questions that come from the heart with a clear mind. A good psychic reading depends just as much on the subject as it does on the psychic that performing the reading. The psychic will take the questions you have chosen and the apply the runic method of their choosing based on the questions that you have given them. This is why it is important to have a very knowledgeable psychic for your reading. Those that have more knowledge on the subject will be able to use the correct layout and method for choosing the symbols that will answer your specific question. Like many other psychic disciplines, knowledge is the most important tenant towards achieving accuracy. Once the psychic is ready they will choose the runes that they are compelled to choose for your questions and then relay what they think that they mean to you for your answer. If you are looking for spiritual guidance there is no right or wrong way to achieve your goals. You may be sick or tarot card, palm, or other more traditional forms of psychic readings. This can be true whether you are looking to get psychic readings for entertainment or if you are legitimately seeking spiritual guidance through psychic means. One of the most important things to consider when getting a rune reading is your sincerity. Those who are not sincere and honest with their questions and their intent when receiving a rune reading will not be taken seriously by their psychic. This is not fair to the psychic that has developed their life to understanding and translating runic symbols for their clients. The best way to get the most out of a psychic runic reading is to have a clear mind, a full heart, and good intentions. The person that is performing your runic reading will be able to sense if you are sincere or not. One of the reasons that it is so important to be sincere and honest is to not break the psychics focus that is performing the rune reading. The most clear minded and focuses they are, the easier it will be for them to pick the right symbols for you. Many are under the impressions that the rune picks the psychic but this is not true.